It seems almost inevitable. The room’s been booked, the invitations have been sent out and the flights are scheduled. Apple must be revealing a Tablet on the 27th. There remains, however, many questions surrounding exactly what form the device will take. I have a particular interest in the tablet’s user interface. Interfaces are something that Apple generally excels at. I went back and watched the keynote from the iPhone announcement recently, and it brought back memories of seeing that interface in action for the first time. It was absolutely revolutionary, but also obvious and somehow familiar. And even now, after three hardware revisions and three major software revisions, the interface remains largely unchanged, and largely unmatched by other manufacturers. So how can Apple match this feat with the tablet, and what challenges does it face? I’ve seen mention from multiple outlets of a scaled up iPhone interface for the Apple tablet, but it’s not quite that simple. The iPhone’s interface is defined, at least in part, by its size. The iPhone’s screen, 89mm diagonally, is not that size by accident nor coincidence. It’s that size because someone with average sized hands can hold the phone and access virtually any part of the screen with their thumbs. This is regardless of whether they are holding the phone in portrait or landscape orientation. Try it. I can comfortably reach two thirds of the way across the screen with my thumb in landscape mode. This means I can access the middle of the screen with either thumb, and the edges with a thumb. In portrait orientation I can hold the phone in my right hand and use the thumb of that hand to access any part of the screen. The diagram below shows the relative positions my thumbs can reach on a 256mm screen when held like an iPhone. 256mm, in case you’re wondering, is approximately 10.1 inches, the most widely rumoured size of the tablet. 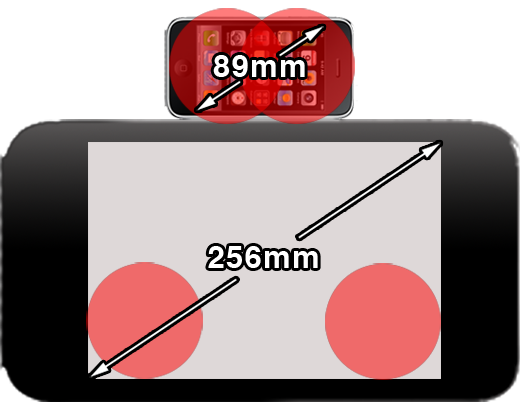 A diagram showing the areas of an iPhone my thumbs can comfortably hit and the same areas shown on a tablet. A couple of things to note about this comparison. We don’t know the exact dimensions of the tablet. If we assume that the screen is 10.1 inches (256mm), then all we know is that the device has to be at least that big. I’ve drawn the “hit areas” I’d be capable of hitting accurately in red on the diagram. For the iPhone these include the screen areas in addition to the bezel of the device. This is a realistic test (I actually used my iPhone to try it out). For the proposed tablet I’ve drawn them so they don’t include the bezel of the device because this is unknown. Therefore, if held in the same way as an iPhone these hit areas represent an almost unachievable best case scenario. The other thing to note is that to get the tablet size I’ve simply scaled it up based on the proposed screen size. In other words, I’ve assumed that the ratio of screen to bezel will remain identical to the iPhone’s. This will almost certainly not be the case, so in many ways the device size (not the screen size) represents the worst case scenario. This exercise demonstrates that the current means of holding and interacting with the iPhone will not carry over effectively to a device of this size. Clearly a rethink is in order. Key to the diagram above is the way in which you hold the device. I’ve assumed that it will be held in a similar way to an iPhone. This may not be the case. There are multiple ways one might choose to interact with a device like a tablet. You may want to hold it like an iPhone (either portrait or landscape) with two hands or with one hand. You way want to rest it on one arm and use the other to use it, like a clipboard. You may want to lay it on a table, or prop it up on a desk. You may want to mount it on the wall in a dock. The problem for Apple is that each of these ways of physically holding or resting or mounting the device requires a slightly different interface in order to be efficient and comfortable to use. With the iPhone, there were only really two options, portrait or landscape. Text entry is one of the outstanding questions that’s really got me stumped. The realisation that people will be physically holding this device in drastically different ways leads you to the inevitable conclusion that text entry is going to be very difficult. Out of the physical ways of holding the device I touched on above, let’s take two examples and expand on them to explore some of the difficulties involved. If a user wanted to hold the device like an iPhone, they will encounter a problem reaching certain parts of the screen, as indicated by the diagram earlier in the article. If Apple were to lay out a virtual keyboard, in the same way they lay out the virtual keyboard on the iPhone, it would be unusable. You would not be able to reach all the letter buttons whilst retaining your grip on the device with both hands. You could hold it with one hand and type with the other but this would be so utterly tiresome as to be useless. Some UMPC devices had soft keyboards that were located in the lower corners of the screen. These were difficult and uncomfortable to use. Image from Gizmodo. An alternative is to group the buttons around the area that’s easily accessible by the user’s thumbs. Sound familiar? It should do. Microsoft tried this with their ill-fated UMPC devices a couple of years ago. Whilst sounding good on paper, these devices never took off. And anyone who had the misfortune of using the keyboard can tell you that it was far from ideal. The odd shape meant you were constantly rotating and stretching your thumb to reach the keys which caused some strain. You also had to re-learn how to type because a key’s position relative to other keys had changed. It’s a testament to the iPhone’s keyboard that it can be so much more effective on a smaller screen, although you could argue that the smaller form factor is actually an advantage in this case. Now consider the device laid on a table. This is where you’d welcome a keyboard configuration similar to that of an iPhone, with the soft keys stretching across the entire width of the screen. In this scenario, you could quite comfortably type on it as a normal keyboard. It would be comparable in size to many netbooks. Two different methods of usage and two vastly different keyboard requirements. When contemplating a device such as this the manufacturer needs to think about the key use cases and optimise the device for those interactions. This is something Apple is truly great at. Apple’s trick is to understand the context of the operation being undertaking (the context) and then adapt the interface such that it’s optimised for that operation. This must have been one of the key drivers of the iPhone’s modal interface (it was specifically mentioned by Steve Jobs at the iPhone unveil). It’s something Microsoft has been notoriously bad at, just look at Windows Mobile for an interface that does many things badly, but simultaneously. This begs the question of whether the interface will be restricted to one app at a time or not (it’s important to distinguish between multi-tasking and having an interface that can cope with more than one app running and make them available to the user). The Navigon iPhone app fills the screen with four main buttons, but doesn't look out of place. The iPhone’s screen size is such that it is well suited to being filled with content and interface devices. It’s not unusual, for example, to open an app and be presented with just four buttons which take up the entire screen. On a device of the iPhone’s size, it makes sense. The hit areas for buttons need to be large enough to ensure accuracy. It’s a similar story with text. The Notes app, for example, comes bundled with every iPhone and fills the entire screen with text when reading. In a single column configuration, with the chosen text size and the iPhone’s screen it works well. It’s readable, and allows a decent amount of content to be displayed. Now consider what these apps might look like on a device with a screen 2.5 times the size of the iPhones (and probably with a higher number of pixels per inch). They won’t port directly over and remain as effective. The notes app is perhaps a bad example as it may end up resembling an A4 sized notepad, but I’m sure you get the general idea. The above gesticulations assume that the operating system will be similar to the iPhones, but it may be closer to OSX. I’ve written previously about certain elements of OSX become more “touch friendly”. I’d love to see a tablet running a full version of OSX (all be it optimised for touch input) but I don’t think Apple will do it. This boils down to whether Apple considers the tablet to be a computer or a consumer device. The reason I think Apple will pitch this tablet as a consumer device, rather than a computer running OSX, is that they’ve tapped in to a previously non-existent market and found it to be incredibly lucrative. The App Store. For the App Store to be successful it has to be the sole point for users to obtain apps. This, by definition (and design), requires the OS to be closed off and tightly controlled. OSX is neither of those things. There are other ways Apple distinguishes between Consumer Devices and Computers. If you look at its line up, consumer devices tend to use Dock Connectors. Consumer Devices also tend to require a computer with an iTunes account in order to sync with. They will not work without a computer. I suspect that both these will be true of the tablet. The iPhone pioneered (it may not have been the first, but it was certainly the best) multi-touch gestures. There were audible gasps in the audience when Steve Jobs demonstrated pinch to zoom for the first time. The iPhone, generally, is used with a single hand interfacing with the device (bar from typing). As a result, the interface is designed to deal with the sort of interface mechanisms that are capable with a single hand. Pinching to zoom is an example of this. It’s easy to do with one hand whilst holding the phone in the other. The tablet however is much larger and requires a different interface mechanic. It will be held differently, as discussed previously. This does present an opportunity, however. It seems that much of the discussion around multi-touch for the tablet has happened under the restrictions of the iPhone. Restrictions such as having to work with only one hand. Restrictions that may not be applicable to the tablet. Rather than thinking of the tablet in terms of the iPhone, it may be more appropriate to think of it in terms of Microsoft’s Surface. When laid on a table, that’s essentially what it becomes. It might allow interactions with multiple fingers on both hands simultaneously. Want to copy some text? Then why not select it with one hand and “tear” it off with the other? It is interactions like these that aren’t really practical on a device like the iPhone, but will be practical on a bigger device. As someone who wants to pick up a tablet, providing it’s as good as I imagine it’s going to be, I’m worried about the rumours of it relying on the mobile networks. I already pay through the nose for my iPhone 3GS contract (on top of buying the actual phone) and whilst I wouldn’t have a problem paying up front for the device, I do have a problem with signing up to a recurring fee for it. It’s possible, although highly unlikely, that Apple can strike a deal along the lines of Amazon’s for the Kindle. Where Apple pays a flat, up front fee to the networks in order to use their data meaning that us consumers don’t have to individually sign up. The data Apple users tend to push around seems to make this highly unlikely. Another possibility is that Apple bakes in incredibly simple tethering support, so you can tether it to your iPhone. if you’re watching the keynote and one of the announcements is for AT&T turning tethering on in the US, I suspect this is the direction in which they’re heading. If they were to throw a 3G chip in there, the benefit of convenience would be outweighed by the inconvenience of having to sign up for another contract (and I am always connected through my iPhone anyway). So, over to you? What do you want, what do you expect? What will make you buy one (or not)? Let everyone know in the comments.